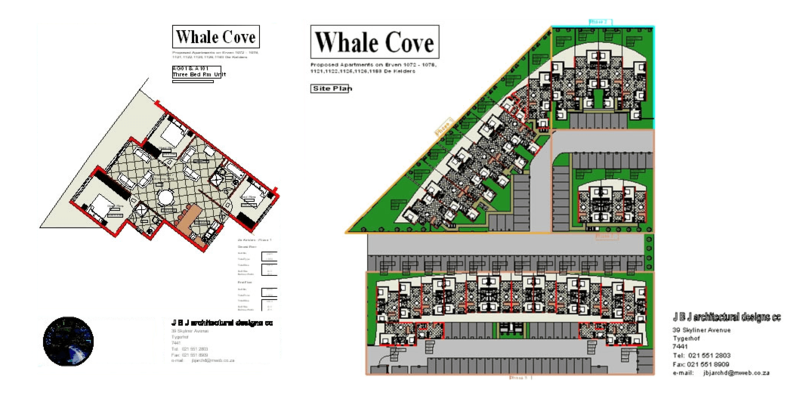 Whale Cove presents a sophisticated self-serving apartment, situated a mere 30 minutes from the seaside Village of Hermanus, offering visitors to this world-renowned area a modern accommodation opportunity, bound to meet even the wildest expectations. Centrally located in the beautiful suburb of De Kelders, the Whale Cove security apartment is positioned directly above the famous Bushman Caves of the area, and is within walking distance from most of the attractions on offer. Staying at Whale Cove also allows ample opportunity for you to spend some time listening to the whales of the area from the comfort of your very own luxury apartment. In De Kelders whales are known to come into the cove and spend hours playing with their calves. While watching from the cliff above, these magnificent creatures sometimes come in so close that you can see the barnacles on their hide. Whale Cove is ideal for travellers and holidaymakers who simply wish to get away from the stresses and strains of daily life and absorb all the beauty on offer within the tranquil village of De Kelders. This well-appointed apartment sleeps six and comprises one double en-suite room, as well as a double and twin room serviced by an additional full bathroom. The fully equipped kitchen and spacious dining room allow you to enjoy all the comforts of home. And after preparing a mouthwatering meal, the lavish living area or comfortable TV room offers the opportunity to simply sit back and relax. You are invited to come and experience all that this magical area has to offer, and let Whale Cove welcome you for an experience guaranteed to remain in your heart, mind and memories for many years to come. This apartment offers beautiful sea views and enough tranquility to take it all in. We offer a reliable network of housekeepers, which will ensure that the house is neat, tidy and clean before you get there. We know that security is high on your list of priorities, and we have taken this into account by installing a state-of-the-art security system, connected to an armed response unit. Upon making bookings we will inform you as to the working of this system. Furthermore, security fencing surrounds this complex, thus you and all your belongings are in safe hands. Also, please make use of the safe provided for any valuable items. Please note that Whale Cove makes use of pre-paid electricity and visitors should purchase electricity for the duration of their stay. click here for more information on how to go about purchasing your electricity. Should you need additional assistance with this do not hesitate to contact us. After booking, upon full payment, we will make relevant arrangements with tenants to hand over keys to the apartment. No smoking is permitted within the apartment, and no pets are allowed. The home may not be used as an events venue. Please contact us to give us feedback on your holiday at Whale Cove.